The facade is clad with oxidized Corten panels and glazed ground floor retail suites that engage a generous pedestrian walkway. The exposed CLT decking provides a variety of warm, expansive creative spaces largely uninterrupted by structural elements. The site on East 6th Street just one block east of Interstate 35 is one of many patches of dirt undergoing rapid development in Austin today. Once occupied by an unpaved auto lot and an automotive garage, nearly half a city block is in the midst of a transformation that will bring five stories and 130,000 sf of creative office space, ground floor retail, and underground parking to a neighborhood increasingly defined by similar mixed-use, urban projects. This particular building, however, is unique. 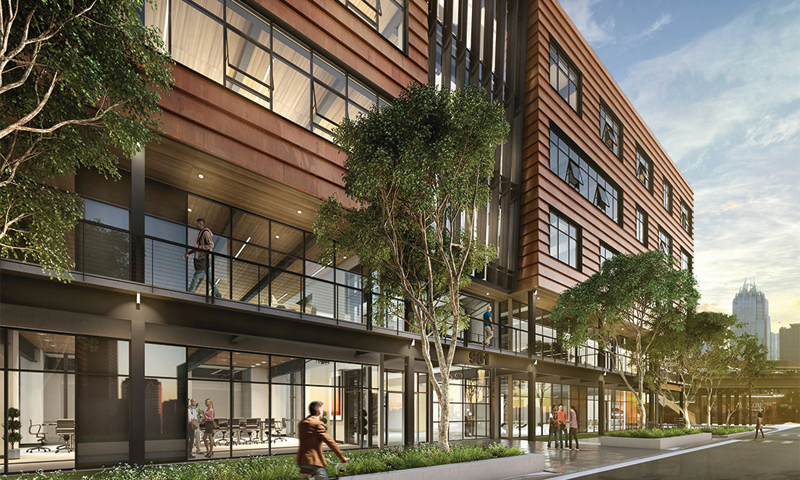 Developed by Endeavor Real Estate with Dennis McDaniel and Richard Kooris and designed by a joint venture between the local offices of Delineate Studio and Thoughtbarn, the mixed-use midrise has the privilege of being Austin’s first hybrid structure that uses CLT — or cross-laminated timber — as a primary structural element. Large prefabricated solid engineered wood panels, sourced from Structurlam in Canada, compose the structural decking in the otherwise steel-framed structure. Offering an attractive and lightweight thermally and seismically high-performing alternative to a traditionally framed building, the CLT modules and steel frame also drastically reduced the number of columns required within each floor plate, compared to an all timber structure. 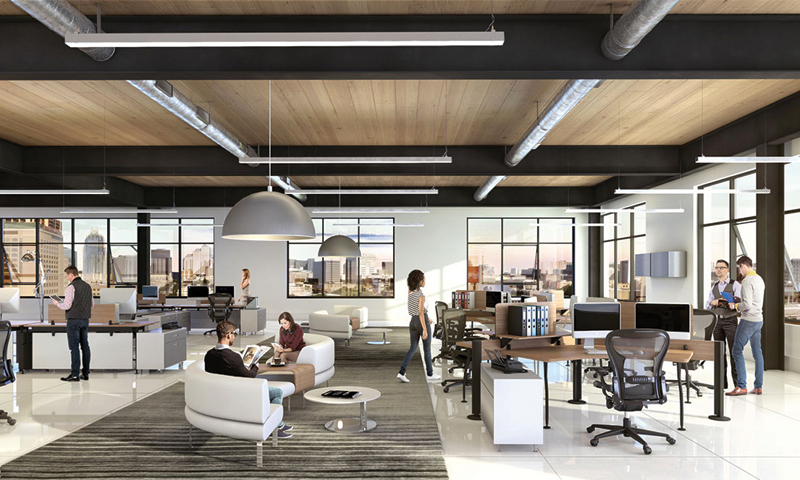 According to Bart Whatley, AIA, of Delineate Studio, this advantage, enabling vast, uninterrupted tenant space, helped dictate the use of the assembly early in the project’s conception. “It was a huge programmatic item, from the beginning,” Whatley says. “The development team had a particular vision from the start that the whole team got behind. It’s always been a values-driven project. The honest and sustainable use of materials combined with the openness and warmth of wood will make this project stand out.” While the developer hopes the payoff will be obvious in the long run, the adoption of a building technique so new to Austin didn’t come without its challenges, especially when it came to code compliance. Classified as a IIIA construction type, the entire structure needed a one-hour fire rating. Meeting that benchmark is no problem for CLT, as it performs just like any other heavy timber element would. As it burns, a sacrificial layer of char about an inch thick develops, insulating and protecting the assembly from further degradation. Proving that to code officials typically requires an acceptable UL rating — a rating the product lacked, despite having been in widespread use in Europe and Australia for decades. To pass code, the design team enlisted the help of fire-engineers from Arup to mathematically calculate the assembly’s fire rating, working to educate city officials. This added cost and time to the project’s budget and schedule, but ultimately paved the way for the integration of CLT in future projects in Austin. As the project nears completion, Whatley is optimistic about the design’s eventual contribution to the fabric of the ever-changing neighborhood and city as a whole. “The ground floor is designed to relate well to the adjacent streetscape. The lobby is designed to accommodate a large bi-fold door that pivots upward to allow for a seamless connection with pedestrian traffic. We’re expecting a lively urban experience with a coffee kiosk, patio, and public engagement.” The development expects to open its doors by the beginning of 2019. Christopher Ferguson, Assoc. AIA, is an architect at Clickspring Design and co-founder of DO.GROUP.